WASHINGTON (Army News Service, Nov. 25, 2008) -- Research that may one day help better train Soldiers, along with helping them heal both physically and psychologically, will be showcased at the 26th Army Science Conference Dec. 1-4 in Orlando, Fla.
Dr. John Parmentola, director for Army research and laboratory management, said this year the Army has chosen to focus the conference on what it believes will lead to "disruptive technology." "At the Army Science Conference we are showcasing seven areas we believe will give rise to disruptive technologies for our Soldiers in the future," he said. "It is not just the individual areas themselves, but it is also the synergy that exists among these areas." A disruptive technology radically changes the way things have been done in the past: the telephone over the telegraph, digital photography over film, desktop publishing over traditional publishing and the automobile and tuck over rail transportation. One of the seven areas of research the Army will showcase at the conference is neuroscience. Parmentola said understanding how the brain works -- the primary focus of the study of neuroscience research -- is important because it leads to development of better training for Soldiers as well as better diagnosis of both traumatic brain injuries and post traumatic stress disorder. "We are trying to utilize the capabilities of neuroscience through various types of brain scans to try to identify objective measures that will enable us to understand when a Soldier has suffered from PTSD or for example TBI," he said. The Army is funding research that measures how the impact of a shock wave from something like an improvised explosive device might affect both a Soldier's skull and brain, Parmentola said. At the Medical College of Georgia, work by Professor Joe Tsien, funded in part by the Army, is looking at how the brain stores memories. "(Tsien) and his colleagues developed a technique where they were able to go into the hippocampus of a mouse and actually study a particular region that stores episodic memories," Parmentola said. The team created for the mouse a series of traumatic events, including a simulated close-call with a "bird of prey," and was later able to "erase" the memories from the mouse's memory. "If somebody was put through an extremely traumatic situation where this was reoccurring and causing this person to not be able to function properly -- it's always a possibility of trying to help people deal with these memories through a mechanism like this," Parmentola said, "This kind of research is helping us understand how the brain works." Parmentola also said neuroscience research leads to better training for Soldiers. "The Army trains 500,000 Soldiers every year and there is a significant diversity of learning abilities among those 500,000 human beings," said Parmentola. "What we are after is to develop better ways of training them so they can all be trained up to certain skill levels." Other Army-funded research aimed at improving Soldier training involves immersive technology, Parmentola said. "That's about creating virtual worlds that are essentially indistinguishable from reality," he said. "One of the key challenges we have in that area is to create virtual humans. Of course the work of neuroscience plays a key role in trying to create virtual humans that, for all intents and purposes, act and interact just like humans." Researchers at the Institute for Creative Technologies, a research institute of the University of Southern California, work to develop virtual worlds that are indistinguishable from reality, Parmentola said. Parmentola said ICT collaborates with the gaming industry in California and with Hollywood to create realistic virtual scenarios that can better help Soldiers train. Those virtual worlds don't just help Soldiers to be prepared to fight better when they get to the battlefront, they can also make it easier for Soldiers to recover from the psychological scars they might suffer while fighting there. "We have been using virtual environments -- pioneered out at the ICT -- to try to see if there are ways, through using training environments, to essentially heal or suppress the episodic memories that Soldiers have when they undergo PTSD," Parmentola said. He explained that researchers found that Soldiers who have suffered from PTSD can be helped by repeated and controlled exposure to environments similar to what they saw in theater. "We are finding is that by putting Soldiers that have suffered PTSD through similar experiences that occurred when they acquired the disorder -- virtual environments where we create explosions and things like that -- we found that a repetitive type of therapy winds up suppressing these episodic memories," Parmentola said. 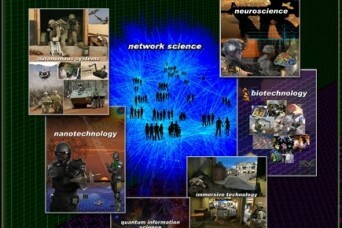 The Army also funds research that may seem like science fiction, but is in fact science reality. Researchers participating in a collaboration between Wake Forest University, N.C., and the University of Pittsburgh are just some of the scientists doing work now on regenerative tissue research -- the growing of new tissue, even entire body parts, for use in both animals and humans. "The really exciting area we have been perusing is trying to re-grow organs and hopefully with time, actual limbs," Parmentola said. "We've re-grown bladders, for example. We've repaired the uterine walls of women who have had uterine damage. It sounds like far-out stuff, but it is stuff that is happening." The Army Science Conference will focus on seven areas of research, including neuroscience, autonomous systems, biotechnology, immersive technology, nanotechnology, network science, and quantum information science.